Excellent opportunity to own a quality farmhouse with a total rebuilt floor area of 160 square metres, built over two floors comprising a stylish loft conversion used as the master bedroom with outstanding views across the local countryside provided by the quality velux balcony windows. Additionally, this property comprises 80sqm of basement suitable for further living space. The property has over 5000 square metres of garden surrounding it, where you will find established olive and fruit trees which can be watered via the 2 wells. The property sits on a private and quiet location, away from the main road, 3 minutes from the town of Alvaiázere. Entering the property through the front door, you will find yourself in the hallway. On the right you have two bedrooms, the first being double aspect and the second single aspect. To the left you have a small sitting room which has a wooden door with glass panels leading on to a sun room with attractive views, then onto a small bright double aspect room that could be used as an office/study or a single bedroom. The second door left off the hallway, leads up to the converted loft which has a cast iron wood burner for heating. The attic is currently used as the master bedroom but could also be used as additional living space. At the top of the stairs there is a stylish glass balustrade which doesn’t interfere with the sense of space. In this room, there is an en suite shower room with electric towel tail and a walk in cupboard providing excellent storage. Light is provided by the front facing dormer and large velux balcony windows. Proceeding further down the hallway there is a set of wooden doors with glass panels which enters a fully modernized kitchen with low and high level cabinets. On the right of the kitchen is a modern shower room with electric towel rail and on the left is a large walk in shelved cupboard providing useful storage.. The kitchen also has a double glazed patio door leading on to the back of the property. From the outside, the entrance to the large basement has a covered arched veranda which provides protection from the elements. There are two doors, one provides access to the larger basement area which also has a door leading on to more room and the other leads on to a single room. From the main road and up the drive, on the right, there is a triangular garden with olive and apple trees. Passing the house there is another garden with a garage. The land at the front of the house is very fertile and has been maintained fully as agricultural land and contains numerous fruit trees. Current owners have started submitting planning permission for installation of a swimming pool where the garage is and converting the basement area of the house into more liveable space. Plans are available to view. Included in the sale are all kitchen appliances including fridge/freezer, electric hob and oven, dishwasher and washing machine. Other house contents and furniture are also available to purchase at an additional cost. 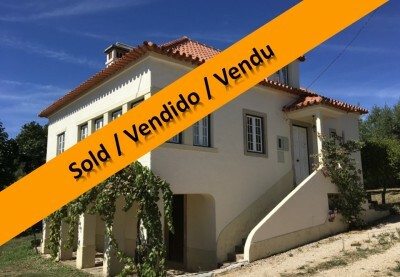 The property is located in the quiet hamlet of Pussos which is at similar distance from the Market towns of Alvaiázere and Cabaços.